Clockworks Press® was founded in 2016 by Brooklyn-based artist and printmaker Holly E. Brown. Ms. Brown’s graphic prints and drawings are inspired by architecture, and balance the rhythm between the rawness of reality and the abstract. Through her dynamic compositions Ms. Brown’s work evokes a precise structure and control of the urban environment. Using a reductive approach to collagraph printmaking she juxtaposes a positive and negative environment where space, form, and perspective are carefully interwoven. Ms. Brown received a B.F.A. from Syracuse University and an M.A. from Brooklyn College. Her solo exhibition “Recente Werken” at Ray Brandstore, a denim boutique in Delft (2016) debuted her work in the Netherlands and sparked her strong interest in working with repurposed denim and creating a more sustainable printmaking practice. She has exhibited in several group shows throughout the United States and Europe. Ms. Brown was an Artist-in-Residence at Grafische Werkplaats, The Hague (2016) and The Cooper Union, NYC (2005). ​Ms. Brown’s prints can be found in the permanent collections of The Library of Congress, Yale University and Princeton University among others. She collaborated with Pulitzer Prize-winning poet Charles Simic on the portfolios "The Pieces of the Clock Lie Scattered" and "Three Poems." Ms. Brown currently splits her time between Brooklyn and The Hague. Most recently Clockworks Press has collaborated with artist De Ver Azul, Tonello and Officina 39+ on a collection of sustainably produced denim artworks and garments for New York Denim Days 2018. In addition, Clockworks launched its first denim accessory, The Denim Clutch at the same event. Clockworks Press launched its first four piece capsule collection in collaboration with AndAgain in late October 2018. Ms. Brown's collagraph print "De Hef" (2018) is on view at The 37th Bradley International Juried Print and Drawing Exhibition from March 9-April 12, 2019 in Peoria, Illinois. 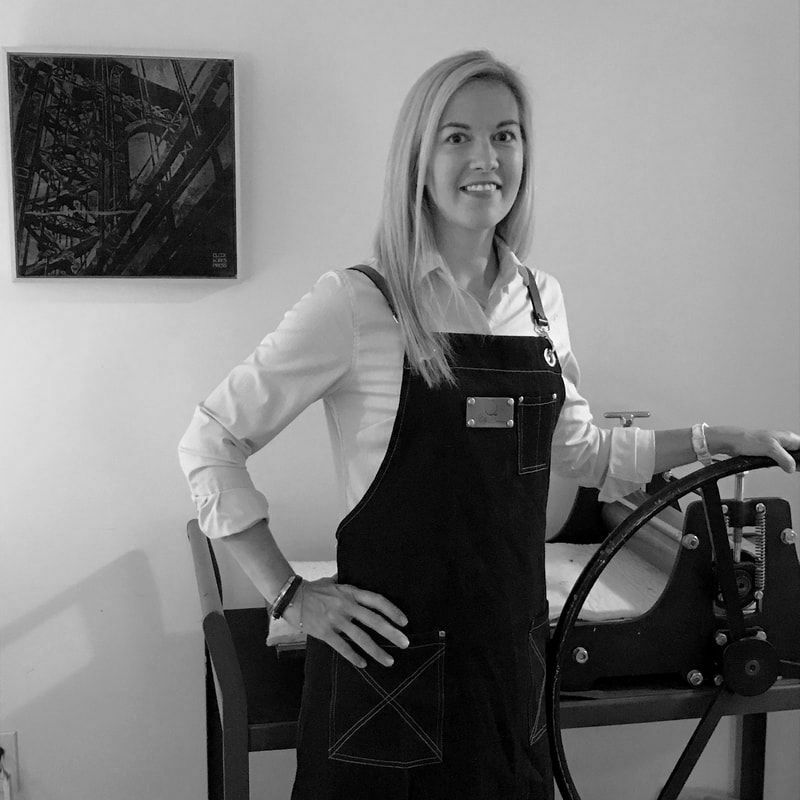 In addition to running Clockworks Press, Ms. Brown has been a full-time art teacher at the Convent of the Sacred Heart for 18 years and teaches printmaking workshops at Atelier Indrukwekkend in Delft, Netherlands. Holly is a featured relief printmaking artist with the Speedball Professional Artist Network.